Bethanie Brown (left) of Waterville High School and Aleta Looker of Ellsworth display their medals following the girls 1,600-meter run at the Class B track and field state championship meet at Mount Desert Island High School in Bar Harbor on Saturday, June 2, 2012. Brown won with a state girls B record time of 4 minutes, 55.23 seconds. Looker was runner-up in 5:08.45. Marissa Shaw of Nokomis Regional High School of Newport, winner of the girls javelin at the Class B track and field state championship meet at Mount Desert Island High School in Bar Harbor on Saturday, June 2, 2012. Shaw won her second straight state title with a throw of 108 feet. 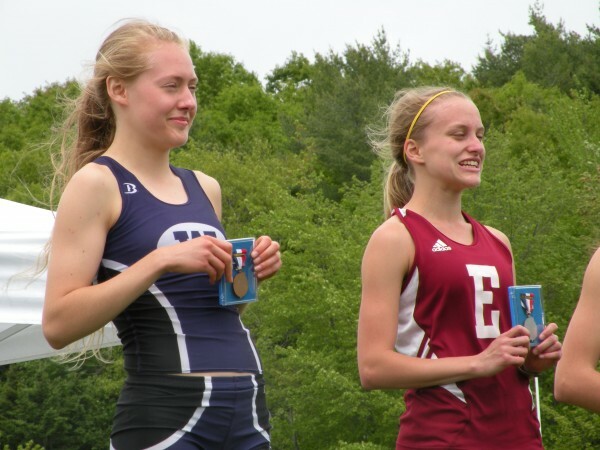 BAR HARBOR, Maine — Speed is usually associated with the sprint events in track and field, but Bethanie Brown showed the Waterville girls have plenty of it in the distance events as well in the state Class B championships Saturday at Mount Desert Island High School. Brown snapped state records in the 1,600-meter run and the 3,200 to lead the Panthers to their sixth straight state Class B outdoor title. On the boys side, York’s victory in the final event, the 4×400 relay, lifted the Wildcats into a tie with Falmouth for the state crown at 93 points each. That was the first time an outdoor crown was tied since Hampden and Kennebunk did it in 1988, the only previous outdoor tie for either boys or girls, according to Maine Principals’ Association records. The indoor crown has been tied three times, the last one coming in 1983. The Panther girls totaled 145 points to easily outdistance runner-up Greely of Cumberland Center with 85. Lake Region of Naples, behind Kate Hall’s three victories including a state mark in the 100 dash, was third with 45, followed by Winslow at 36, Falmouth 34 and Old Town and Poland Regional tied at 32. Waterville was a close third among the boys with 84 points with Medomak Valley of Waldoboro fourth at 50, Gray-New Gloucester 44, Greely 42, Camden Hills 33 and Caribou 28. In the girls meet, Brown, who won the 1,600 last year as well, was seeded almost 10 seconds better than the old 1,600 mark of 5:01.10, set by Melissa Blackstone of Presque Isle in 2001. Brown, a junior, cruised home this year in 4 minutes, 55.23 seconds, more than 13 seconds ahead of runner-up Aleta Looker of Ellsworth (5:08.45). “I’ve been running sub-5 [minutes] all season, so I thought it was doable,” she said. While the time was a record, she felt she could’ve done much better. Her PR, which was also her seed time, is a 4:51.84 from the Loucks Games in New York in May. She thought her eagerness may have cost her some time. Brown blew away the field in the 3,200 before breaking the tape in 10:34.79. That snapped the mark of 10:39.43 set by Cassie Hintz of Old Town in 2004. Kirstin Sandreuter of Greely was a distant second to Brown in 11:12.62. Hall’s 12.33-second effort in the 100 held off defending champion Georgia Bolduc of Waterville and was the opening shot between the sprinters. Bolduc, who posted a 12.38 in winning last year’s state 100, ran a 12.50 this year. “I just came off an injury [to her right quadricep] and had to take the Western Maine championship off,” the freshman said. She put any thoughts of the injury aside when it came time to race. Bolduc said she thought she broke out of the blocks faster, then Hall passed her. Bolduc later led the 4×100 team to victory (50.83), but Hall won the long jump (17 feet 1½ inches) and topped Bolduc again in the 200 (26.12 seconds to 26.77). Host MDI’s quartet of Olivia Erickson, Maggie Painter, Malia Demers and Isabel Erickson claimed the opening event, the 4×800 relay, in 9:44.36, while Waterville was seventh. But Alex Jenson led Waterville to a sweep of the top three spots in the 100 hurdles with a 15.38 clocking. The Panthers also took fifth to pick up 27 points as they raced off to the title. Other strong Waterville performances came from Olivia Thurston’s win in the 300 hurdles (46.05), Jenson’s win in the triple jump (35-7¾) and second in the long jump (16-9), and a win in the final track event, the 4×400 (4:06.77). 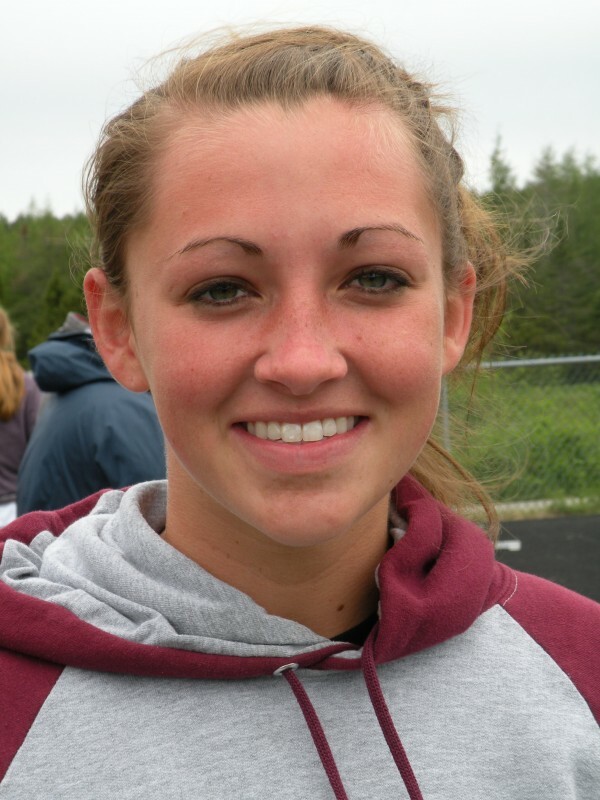 Marissa Shaw of Nokomis of Newport won her second straight javelin state title, throwing 108 feet to win by 2 feet. This is Shaw’s second year on the track team after playing softball her first two years. “I find myself keeping track of school better when I have something to do,” said Shaw, who made the Bangor Daily News All-Maine schoolgirl basketball team again this year and has been all-state in field hockey, too. Looker came back after the 1,600 to win the 800 in 2:19.69. On the boys side, the only state mark was set by Falmouth in the 4×100 relay in 43.99 seconds. The old mark was a hand-timed 43.8 by York in 1981, and after officials made a standard adjustment in comparing computer timing vs. hand timing, the Falmouth team of Jacob Buhelt, Matt Kingry, Grant Burfiend and Jimmy Polewaczyk was awarded the state record. Just as important was the Yachtsmen’s runner-up finish in the 4×400. Falmouth held a two-point edge over York and five points over Waterville. The York team of Tucker Corbett, Joe Vogel, Tom Rasche and Tyler Martin was seeded No. 1 and ran a clean race in 3:32.01 to hold that seed. Falmouth knew it had to finish no more than one spot behind York and the Yachtsmen did that, earning the tie. Waterville came in fourth. “We didn’t know who was in third place, but we knew we had to beat them,” said Polewaczyk, who anchored Falmouth’s 4×400, too. “It was nerve-wracking. Crazy but fun,” said Falmouth coach Danny Paul, upbeat despite the tie. “It’s a very real rivalry, but it’s one of the most positive rivalries you can have,” said Paul of his team’s competition with the Wildcats. York coach Ted Hutch said he didn’t assume anything despite having the top-seeded team in the last event. Among the other boys events, Caribou’s Josh Kovach and Austin Griffeth went 1-2 in the 1,600 racewalk, the only sweep among the boys. Kovach finished in 8:03.70 and Griffeth in 8:14.58. Eastern Maine boys did well in the field events with Zach McFarlin taking the high jump at 6 feet on a tiebreaker, Marcus Riley of Belfast won the long jump at 19-11 and Yannick Price Prevot of Medomak Valley won the discus with a throw of 138-8. Sprinter Caleb Pease of Camden Hills posted three seconds, in the 100, 200 and 400.